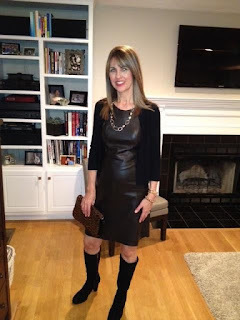 This fall, I treated myself a leather dress from Banana Republic. I initially ordered it online but waited to checkout, and by the time I did, it was gone :( But I was meant to have this dress...low and behold, a few weeks later there was ONE left in the store in my size for 40% off...yay!!! I love it because of a few reasons. 1. It's comfortable!!! When buying leather look for good quality, glove soft leather that moves with you and isn't stiff. This dress is so soft and buttery! 2. It goes with so many pieces in my closet. From a cardigan to a jacket or "as is", it's a versatile chic piece that I will wear often. 3. It can be worn for 3 out of 4 season....spring, fall and winter. 4. I feel GREAT in this dress...chic and stylish!